sony | Welcome to the Underground. Some of you guys know this, but some may not, but I run a Youtube channel called vstPower. I could tell you the sad sob story of how GameDexterity was shut down by youtube after 3 years, 9400+ subs, but I’m not going to. That is what the first video upload on vstPower channel is all about. Rather, I am here to talk about something else that most people may not even realize, and that is about the PS2 playlist! In the coming weeks, I will go back to old PS2 articles I have written and update them so that they reference the correct video, but in the meantime, did you know that everything that you need to know about PS2 modding, FMCB, and more is right here under your nose? All you got to do is check out the PS2 playlist, watch a few videos, and get up to speed! But don’t take my word for it, as they say, seeing is believing. Click the link below, check out some of the PS2 videos, and if you got questions, either leave a comment on the Youtube video, or leave one here. Thanks! Do you own a Sony game device? Maybe its a PS1, PS2, or a PSP. Did you know that all Sony game products are jail-breakable or moddable? I am a proud owner of several Sony devices, and I have taken great joy in jailbreaking them to do things that the consumer was not able to do in the first place. The greatest feat of it all is being able to make backups of my games so then I can preserve the original copies. However, we know that the Playstation scene is a constantly moving force. It is can be tough sometimes to find good and legit news that isn’t faked, or maybe you want to know about the latest homebrew programs or hacks for your favorite Sony device. Where do you get started? Do you have a spare Playstation 1 or Playstation 2 controller? 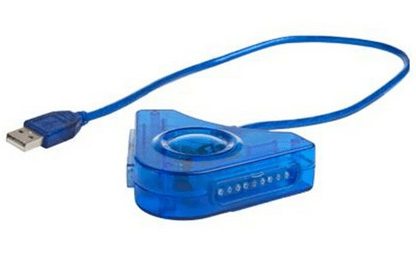 Did you ever wish you could connect it to your PC to play your Emulator or possibly PC games? How is it done? Easy! You have to go and purchase a Playstation to PC adapter, and these adapters are fairly cheap, especially if you go online. I bought mine from Amazon before X-mas last year, and after shipping the total was under $5 USD! How it works is you connect the Playstation controllers to the adapter (1 or 2), and then you connect the USB to the PC. No driver download required! The one I got works great on XP and Windows 7. Watch the video tutorial below and see what you might have been missing. 9-13-12: Fixed video tutorial link. Hey guys, a text tutorial will be coming with pictures (maybe), but for now please watch my tutorial video below for the quick way. 2) FMCB already installed on the memory card. 3) A USB thumb drive to hold your homebrew programs that you got off the internet. SKSapps.com is a good site to get your homebrew programs. Now watch the video below and learn the concept of adding programs to the memory card, and how to make them show up on the main menu! As we continue with the PS3 Jail Breaking journey, it might be important for the user to know what games are compatible with the PS Jailbreak type devices. There used to be a list running on Google Docs, but the SCEA had worked with Google Documents to have it taken down. 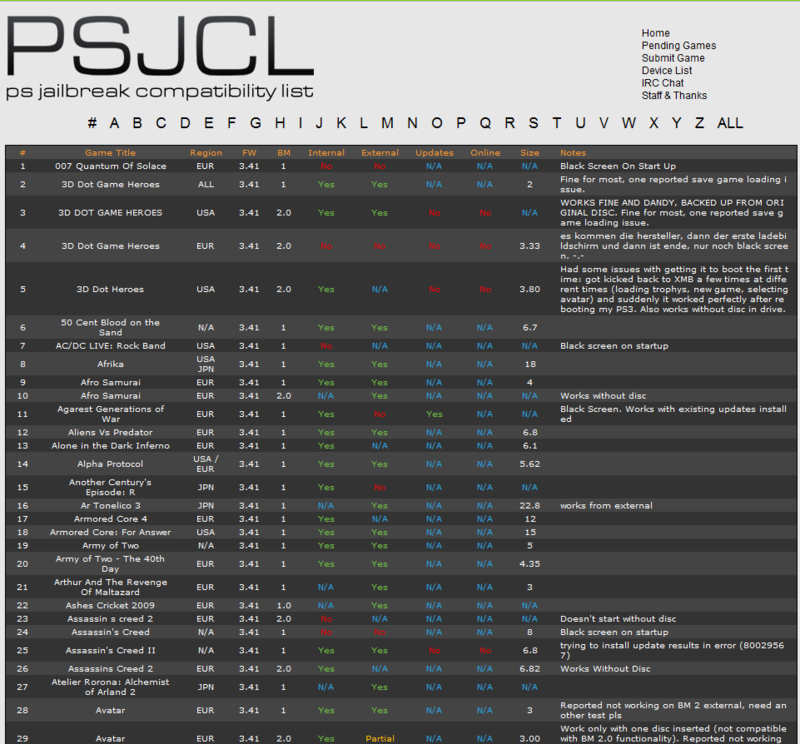 In light of this, there is a new website that strives to maintain this database, and you can find it at http://www.psjcl.com/gamelist-all. If you are a jailbreak PS3 dongle owner, or just a gamer who is wondering if game XYZ is working, check the list! This might be old news for some, but this might be good news for many. There is a device called the PSJailbreak that allows the user to run homebrew applications. Even more importantly, it gives the user the ability to play homebrew games off the hard drive. So for example, it can copy the blu-ray game to your hard drive, and then you will be able to play it without the disc. Before you get too excited, the price of this is $175 USD. Even more interesting, Sony caught word of this and has already told the Austrailian modchip store that they cannot sell the modchip, and now they are going after USA retailers! The good news is that there is another clone(s) in the mix and it is called PSGroove. The source code is open, meaning that anybody can use it, and Sony can’t sue anybody. However, the code does not let you play backed up games, but its possible someone will use it for less than legal purposes. To catch up on all the PSJailbreak news, go here. [How To] play Videos, movies and Mp3s off USB on PS2 using SMS DIVx media player. Foreword: I was chatting with versatile1, the day before I started this tutorial and he spurred up this amazing thought of ‘PS2s being preferred over DIVx players’. Do you know that the PS2 costs $99, and do you also know that the DIVx players cost like about 40 – 50 Dollars ??.. So, the difference is just $50 of cash. But, the PS2, unlike any DIVx player, is a gaming console and the list of games might arguably exceed the 2,500 mark. And by buying a copy of Swap Magic, we could play backed up PS2 games. Bottom line ~~> That extra $50, was definitely worth it !! 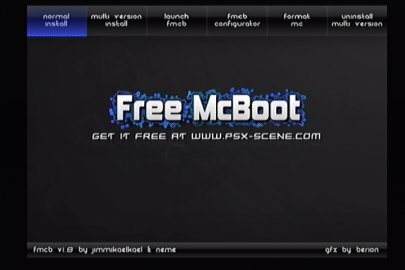 [12-27-09] Added Versatile1’s ‘Free McBoot’ Video Tutorial. [12-30-09] Added Versatile1’s SMS video Tutorial. [1-25-2010] Added links to the latest version of ULE and added Versatile1’s DVD decrypter tutorial. The PS2, being a legendary console, never lets you down when it comes to surprises. And the Simple Media System (SMS) is one such surprise. The SMS media player is a PS2 application, which lets you play DIVx media files on the PS2. The SMS media player is equivalent, or maybe even superior to any ordinary DIVx player. NOTE: The supported media formats are AVI, DIVx, Xvid, mpeg1, mpeg2, ogg, mp3, ac3, srt (subtitles), wma, asf and pcm. Frequency of Story: When it feels right. In the meantime, I encourage all forms of interaction. Please sound off in comments, I’d appreciate it. If you have an idea, or want me to consider something different, I will. If you want to spread the word, be my guest. As time goes along, I’m asking for people to contribute, or if you want to be interviewed (I’ll protect your identity), then we can dig deeper. Please consider my offer, thanks!